The Aqua Cure WB is a water based concrete curing compounds are liquid membrane type materials, available in several grades for specific purposes. All grades are basically composed of low viscosity wax emulsion which incorporate a special alkali reactive emulsion breaking system. Gives clear water repellent film. Initial white colour shows areas of application. Pigmented compounds give solar reflective film. Concrete Master is a liquid admixture to improve workability and compressive strength of concrete and makes concrete more homogenious. It prevents segregation and bleeding of concrete. Concrete Master extends workability of concrete mixes. THis is an advantage especially in hot weather when the increased workability allows more time to place and work the concrete. It also reduces drying shrinkage and cracking. The concrete becomes more cohesive and will not segregate. Better workability: Helps to place the concrete in congested place. It improves economy by reducing cement and labour costs. In hot weatherit acts as a coolant. Shrinkage and cracking are minimized. Concrete produced by using Concrete Master is more durable and whether resistant at a nominal additional cost. Aqua Satter Release MRA is a chemical release agent suitable for mould and shutter faces prior to casting concrete in order to achieve a clean release. After release, after removal of the formwork, the resulatant concrete has a smooth hard uniform finish with reduced incidence of blow holes. Aqua Satter Release MRS can be applied to the formwork by spray in the form of a light uniform mist coating. 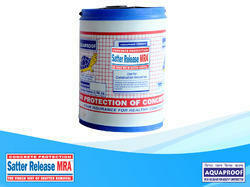 Aqua Satter Release MRA gives better release properties and reduces the incidence of blow holes in the concrete face. 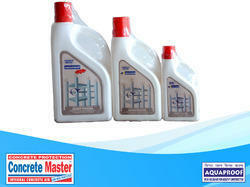 Aqua Satter Release MRA is non-standing and can be used on work employing white cement. Aqua Satter Release MRA had a higher coverage than moulds oils due to its low viscosity. Aqua Satter Release MRA treated plywood and timber moulds are waterproofed, thereby preventing swelling and ensuring there is no variation in the hydration of the cement. Steel moulds are protected against rust and prolonged application will assist in the removal of existing rust. Aqua Satter Release MRA may be applied to weatherproof moulds and shuttering. THis application may be made sometime before the moulds are required to use. The Aqua Satter Release MRA will still remain effective. Aqua Plast 330 is liquid water reducing plasticizer based on refined lignosulphonates. Significantly improves the workability, therefore easing placing. Improves the cohesive properties of the concrete helping to reduce segregationa nd bleeding. Allows water reduction in the ratio of 10% to be achieved whilst maintaining workability thereby increasing strength, durability and impermeability. It also works as a coolant. Enables economies in mix design by saving cement. Looking for Concrete Protection ?